It’s been an unusually busy semester at university, which means I haven’t had much of an opportunity to work on my blog. But on the weekend, during a lull in marking, I finally got the chance to see Ridley Scott’s The Martian. The film represents a unique opportunity for me. I reviewed Andy Weir’s novel The Martian on my blog late last year; it is the first time a book I’ve reviewed has been subsequently turned into a film. I wasn’t surprised when I learnt that The Martian was being adapted – it is a story that lends itself to cinema, a taut science fiction thriller that taps into our fascination with the red planet, as well as our hunger for survival stories. The recent discovery that water is flowing on Mars has certainly helped The Martian at the box office; I love these little moments of coincidence that are often so fortuitous for science fiction. 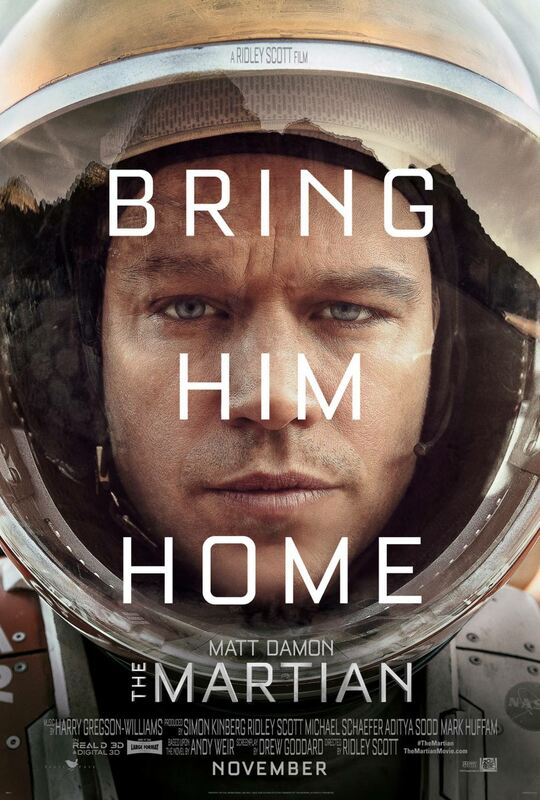 The story follows astronaut Mark Watney (Matt Damon) as he is stranded on Mars and must survive until he can be rescued. It’s an environment that is inimical to human life – if any one of the systems that are keeping him alive fails, he will perish. Back on Earth, the resources and ingenuity of the various space agencies are pushed to the limits as they consider how to rescue Watney. Going into the cinema, I was determined that I didn’t want to compare the film to the book. Such analyses always end in frustration. However, Ridley Scott’s The Martian is a fairly true adaptation, following Weir’s novel quite closely, meaning that many of the comments I made about the book also carried over into the film. There are some variations in the story – the film version doesn’t include some major plot points which means that Watney isn’t in as much trouble as the book – but the overall story arc is identical, and the same themes permeate Scott’s interpretation. After the thematic disaster that was Prometheus (2012), The Martian represents a return to form for Ridley Scott’s science fiction oeuvre. I loved this movie. It is a simple story, but it feels like a classic science fiction tale. Coupled with gorgeous visuals and a tight narrative, it is a celebration of science and the scientific method. The film is aided by a great cast. Matt Damon successfully carries the film, conveying both gallows humour and desperation, often working with nothing more than a video screen as a prop. The crew of the Hermes are equally strong. Jessica Chastain is particularly memorable as Commander Lewis, burdened by the guilt that she left a crewmember on Mars. The Hermes crew weren’t extensively developed in Weir’s novel, so putting actors into those roles and allowing them to flesh them out helped lend further emotional depth to the movie. Back on Earth, Chiwetel Ejiofor and Jeff Daniels, playing Mars mission director Vincent Kapoor and NASA Director Teddy Sanders respectively, do a great job in conveying the frustrations of being mired in a bureaucratic system. It is also a beautiful film to watch. The panoramas of the red planet, with spires of dust rising in the background, achieve the haunting, desolate feel that highlights Watney’s isolation. The shots from orbit reveal its fractured landscape. Mars has never been so impressively realised on film. I don’t want to be “that guy,” but if you zoom in on this picture, you can clearly see small plants amongst the rocks on the left side of this picture. FAIL. It is the depiction of the planet that really captured my imagination. In my review of the book, I noted how Mars remains stubbornly resistant to human colonisation. This isn’t a problem that can be overcome by the willpower of the protagonist – the environment rejects the human desire to assert control. In the film, the planet’s resistance to colonization is reinforced by the cinematography. Watney’s rover is reduced to a mere speck in the sweeping panoramas of red cliffs and vast plains. We are constantly reminded of his insignificance, his precarious existence on a planet that was not meant for human life. Scott contrasts the vast landscapes with the claustrophobia of Watney’s tiny habitat. And this is where the psychological torment becomes acute – despite the vast wilderness outside his door, his actual living space is cramped and fragile. In one scene, he crouches in his habitat as a dust storm rages outside, flinching with each rattle. Despite his jokes about colonization, Mars remains implacable. I previously compared the plot of The Martian to the type of story known as the Edisonade. It certainly ticks most of the boxes: Watney is the hero-engineer who overcomes obstacles through sheer ingenuity and rational thinking, saving himself from defeat. Parts of the story feel like a grand adventure across the surface of Mars. However, the Edisonade typically ends with the protagonist asserting ownership over the unclaimed territories, a mastery over nature. This certainly doesn’t happen in The Martian – as noted above, the planet rejects Watney’s claim to dominion. The story incorporates a lot of elements of the Robinsonade – the story of an individual surviving in a hostile environment. But even Robinson Crusoe eventually asserts a sort of control over his island. Watney cannot hope to tame Mars. 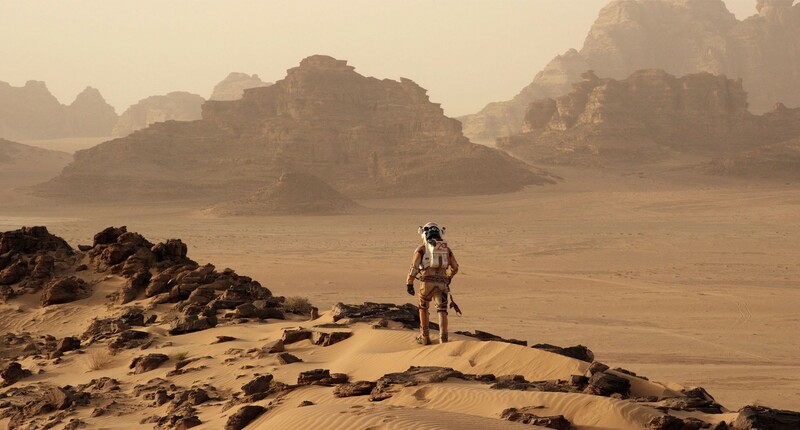 The Martian is part of a recent trend of “stranded astronaut” films. Gravity (2013) sees an astronaut desperately trying to return to Earth after a cloud of debris destroys her space shuttle. 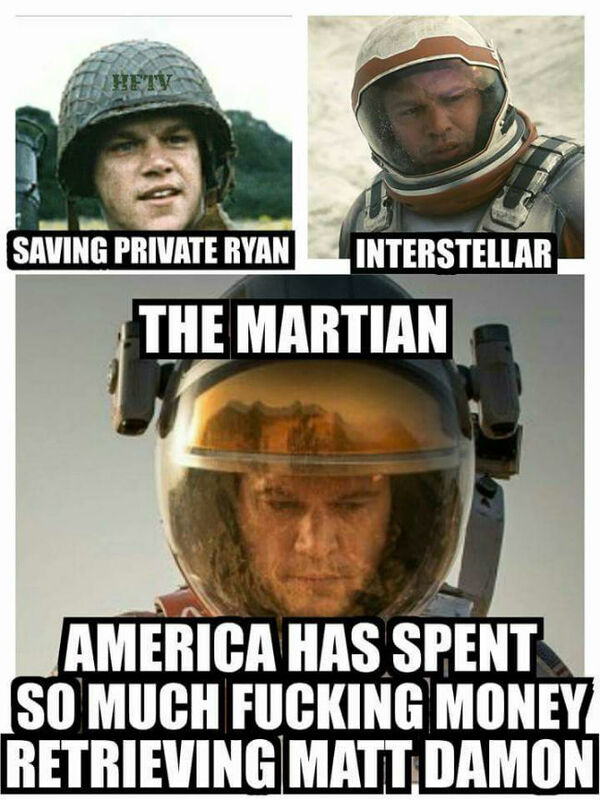 Last year’s Interstellar also features the rescue of an astronaut stranded on a distant planet (also played by Matt Damon, leading to the meme pictured below). All three of these films aspire to some level of scientific verisimilitude, not just in their depiction of science, but in their portrayal of space as a environment that is hostile to humankind. It’s certainly a change from the optimistic colonisation tales of Golden Age science fiction, where the idea that humans could conquer other planets as easily as we conquered distant lands on Earth was often axiomatic. It’s also something of a signature of Ridley Scott – the deadliness of space took physical form in Alien (1979). The film still manages to convey a disdain of bureaucracy, which was one of my criticisms of the novel. NASA is positioned as a sort of hindrance to Watney’s survival; any real success is realised through the actions of individuals. Even as rival space agencies work together to solve the problem, it is still the heroic individuals that implement the rescue. However, any criticism I have towards the film is vastly outweighed by praise. Just when I thought Ridley Scott couldn’t hope to impress me, he delivers a tense, gripping thriller. It’s the sort of film that inspires my love of science fiction. And although it might not be a trendsetting film like Alien or Blade Runner, it has certainly influenced our visions of Mars. Future science fiction texts about the red planet will owe a debt to The Martian – it has taken us there, however briefly.